Multitudes of volunteers and performers shook up Twin Pines Park on Oct. 14 from 11:00am to 5:00pm during the 10th Annual Save the Music Festival. 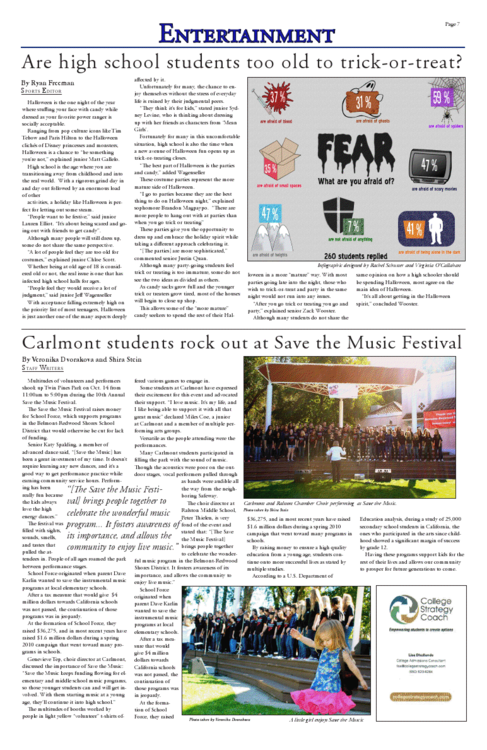 The Save the Music Festival raises money for School Force, which supports programs in the Belmont-Redwood Shores School District that would otherwise be cut for lack of funding. The festival was filled with sights, sounds, smells, and tastes that pulled the attendees in. People of all ages roamed the park between performance stages. School Force originated when parent Dave Karlin wanted to save the instrumental music programs at local elementary schools. After a tax measure that would give $4 million dollars towards California schools was not passed, the continuation of those programs was in jeopardy. At the formation of School Force, they raised $36,275, and in most recent years have raised $1.6 million dollars during a spring 2010 campaign that went toward many programs in schools. The multitudes of booths worked by people in light yellow “volunteer” t-shirts offered various games to engage in. Multiple students at Carlmont have expressed their excitement for this event and advocated their support. “I love music. It’s my life, and I like being able to support it with all that great music” declared Miles Coe, a junior at Carlmont and a member of multiple performing arts groups. Versatile as the people attending were the performances. Many Carlmont students participated in filling the park with the sound of music. Though the acoustics were poor on the outdoor stages, vocal performers pulled through as bands were audible all the way from the neighboring Safeway. By raising money to ensure a high quality education from a young age, students continue onto more successful lives as stated by multiple studies. According to a U.S. Department of Education analysis, during a study of 25,000 secondary school students in California, the ones who participated in the arts since childhood showed a significant margin of success by grade 12. Having these programs support kids for the rest of their lives and allows our community to prosper for future generations to come.